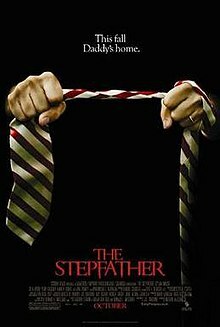 The Stepfather is a 2009 American slasher film and a remake of the 1987 horror film of the same title. The film was directed by Nelson McCormick and stars Penn Badgley, Dylan Walsh and Sela Ward. The original was directed by Joseph Ruben and shot from a script by Donald Westlake. The films are loosely based on the crimes of mass murderer John List. In a suburban Utah house, Grady Edwards (Dylan Walsh) transforms himself in a bathroom. He shaves off his beard, dyes his hair, and removes his brown contact lenses. He goes downstairs with his luggage and fixes himself peanut butter toast and coffee. As he leaves the house, the camera reveals the bodies of his wife and her three children. As the police investigate, it is known that another family was murdered in similar fashion in New Jersey not long ago, which leads them to believe there is a national serial killer on the loose. Susan Harding (Sela Ward), a recently-divorced Oregon housewive, is shopping in a grocery store with her youngest children where she meets Grady, who introduces himself as David Harris, a man who lost his wife and daughter in a car crash. He charms her, and six months later, they are engaged to be married. Susan's eldest son, Michael (Penn Badgley) returns home from military school and is wary of the situation. David invites him down to the basement, where he has installed locked cabinets, and tries to befriend Michael over tequila shots. Michael's suspicions start when David uses the wrong name when mentioning his deceased daughter. After Susan says that an elderly neighbor warned her that America's Most Wanted ran a profile on a serial killer that looked like David, David barges into the woman's house and throws her down her basement stairs, then suffocates her. Susan's ex-husband Jay confronts David angrily about laying hands on his younger son, Sean, after David grabbed the boy roughly for failing to turn down the volume on his video game. He warns Susan that she knows nothing about David. Doubts about David mount further when he quits his job working as a real estate agent for Susan's sister, Jackie (Paige Turco), to avoid displaying a photo ID and other forms of identification. Later, Jay confronts David about an apparent lie regarding his college history. David clubs him with a vase and suffocates him with a plastic bag. He sends Michael a text with Jay's phone saying that David checked out okay. When the neighbor woman's body is discovered two weeks later, David tells the family. Michael is alarmed because he overheard David being told by the mailman, who gave less detail than David. While Michael's girlfriend, Kelly (Amber Heard), tries to get him to focus on college applications, he grows more obsessed with the contradictions in David's stories. Michael is obsessed with David's stories and Kelly leaves. The situation comes to a head when David intercepts an email from Jackie about hiring an investigator. He then goes to Jackie's house and drowns her in her pool. Determined to discover what was in the locked cabinets, Michael breaks into the basement as Kelly keeps a lookout. In the basement, Michael eventually discovers his dad's body in a freezer. David knocks out Kelly and traps Michael in the basement. The commotion awakens Susan, and he berates her parenting skills and says that he thought she could be "Mrs. Grady Edwards". On Susan's stunned reaction, David grimaces and asks, "Who am I here? ", Susan tries to snap him out of it, saying his name, causing him to say "David! I'm David Harris!" Susan, realizing the situation after noticing the unconscious Kelly, flees to the bathroom, locking herself in. David kicks the door in, shattering the mirror behind it. Susan picks up a shard of the glass mirror, holding it behind her. David grabs her, they struggle, and she manages to stab him in the neck with the shard. He falls to the floor, apparently dead. Michael escapes from the basement and finds Kelly. They find Susan in the hallway across from the bathroom, thinking David is dead. Then David approaches from behind and blocks the stairs, chasing all of them into the attic, where he and Michael fight. Both fall onto the roof and then off the edge of the roof to the ground, where they lie unconscious. When Michael wakes up, he finds out he had been in a coma for just over a month. He learns that David is still alive and fled the scene before the police arrived. The end scene shows David, who has again changed his appearance and his name to Chris Ames. He is working at a hardware store when he meets a woman (Jessalyn Gilsig) who was shopping with her two sons. The film was distributed by Screen Gems. Filming was completed on April 15, 2008. Terry O'Quinn who portrayed the stepfather in the first two installments of the series, was approached by director Nelson McCormick to appear in the remake in a cameo role, but according to producer Mark Morgan, O'Quinn turned down the offer. It was released in cinemas on October 16, 2009. Sony Pictures Home Entertainment has released the film to DVD and Blu-Ray on a special Unrated Directors Cut containing a few more special features and depicting each death in the film in a more graphic tone. The Stepfather received negative reviews. Review aggregator Rotten Tomatoes gave the film a rating of 11%, based on 61 reviews, with a rating average of 3.4/10. The site's general consensus reads, "This tepid remake of the 1987 cult classic lacks the tension and satirical undercurrents of the original." On Metacritic, which assigns a weighted average score, the film has a score of 33 out of 100, based on 11 critics, indicating "generally unfavorable reviews". Kevin Thomas of the Los Angeles Times wrote of the film being "a piece, a handsome, thoughtfully crafted production that generates a mounting terror securely anchored by assured performances, consistent psychological persuasiveness and believable dialogue." The Stepfather grossed $29.1 million in North America and $2.1 million in other territories, for a worldwide gross of $31.2 million, against its budget of $20 million. The film opened #5 at the box office, grossing $11.6 million in 2,734 theaters, with an average of $4,236 per theater. ^ "How Dylan Walsh makes the new Stepfather a killer remake". Sci-Fi Wire. Archived from the original on 2009-07-04. Retrieved 2009-07-18. ^ "The Stepfather (2009)". Rotten Tomatoes. Flixster. Retrieved 2010-03-08. ^ "The Stepfather (2009): Reviews". Metacritic. CNET Networks. Retrieved 2010-03-08. ^ "'The Stepfather' Movie Review". Los Angeles Times. Tribune Company. 2009-10-17. Archived from the original on October 20, 2009. Retrieved 2009-11-01. ^ "The Stepfather (2009)". Box Office Mojo. Retrieved 2010-03-08. ^ "Weekend Box Office Results for October 16–18, 2009". Box Office Mojo. 2009-10-18. Retrieved 2009-11-01.